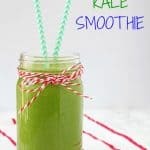 A tasty dairy free smoothie packed with kale, pineapple, mango and melon. A super delicious and healthy start to the day! Add all the ingredients to a blender and blitz until smooth.